A post by InNate James discussed his possible family connection to the notorious outlaw, Jesse James. He mentioned that the James family tried to disassociate themselves from him. That was not a universal response to his deeds, though. My family tree sports one “Jesse James Brooks,” for example.1 He was born in 1876, the year many of the James’ gang were killed by the citizens of Northfield, Minnesota, during a bank robbery, just one state away from my Jesse’s birthplace, South Dakota.2 His birth preceded the fateful robbery, though. It got me thinking about all the children in history who have been saddled with the names of reknowned people (the good, the bad, and the mediocre – ugly may be in there, too). Probably no one could count the number of “George Washington so-and-sos” found throughout the late 18th and 19th centuries. I found one George Washington and five George Ws on my tree alone. I’d never heard of him, but clearly Price was a hero to my great great-grandfather. How many southern boys, do you suppose, bore “Robert E. Lee” as their first and middle names? Children today get named after prominent entertainers more often than they are named for politicians and criminals. Women have started making the grade, too. Beyoncé? Check. Madonna? Check. 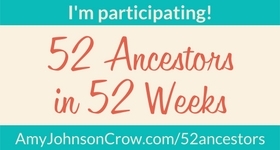 How many “famous names” are lurking in YOUR family tree? Let me know! Excellent question. I have a grandmother who might have been named for Anne Hutchinson, the spunky woman, a Puritan, who got thrown out of MA in the 1600s for her liberal Christian views. As a child I never knew if this was a guess based on this grandmother’s outspokenness or if it was a fact. There’s no one left to ask… so in answer to your question… maybe. So interesting. I’ve heard of many families trying to trace to Jesse James! I don’t think there are any famous names in my family tree at all. They tended to replicate family names until the last 70 years, although even there my cousin’s son carries a name that has been in the family for many centuries from the Netherlands. I wonder why anyone would want to tie themselves to such a bad character. No one wants to be associated with Hitler, right? I would say “right,” but I’ve heard people do name their kids after Hitler. So many weirdos out there!